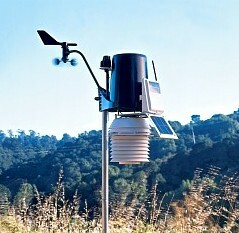 First and only weather station in its class to use frequency hopping spread spectrum radio technology to transmit weather data wirelessly up to 1000' (300 m). Includes Vantage Pro2 console/receiver, integrated sensor suite (ISS), and mounting hardware. ISS includes rain collector, temperature and humidity sensors, anemometer, 40' (12 m) anemometer cable, solar radiation sensor, UV sensor, sensor mounting shelf, and solar panel. Temperature and humidity sensors are enclosed in solar-powered, 24-hour fan-aspirated radiation shield. Shield combines fan aspiration and passive shielding to minimize the effects of solar radiation. ISS is solar powered. Electronic components are housed in a weather-resistant shelter. Wireless range is up to 1000' (300 m) outdoors, line of sight. Typical range through walls under most conditions is 200' to 400' (60 to 120 m). Can add wireless repeaters for distances up to 1.7 miles (2.7 km).